I’m so excited to share a new one-pan recipe with you guys. 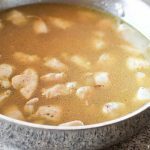 Dinner recipes are some of my most popular posts, and I think it’s because new ideas for dinner are always welcome. New one-pot dinners are especially welcome because they are so easy. 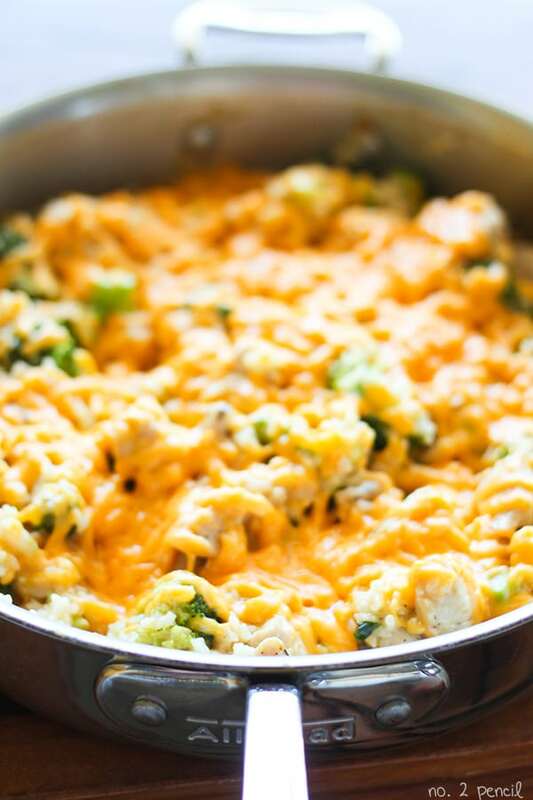 Today, I’m sharing this easy One-Pan Cheesy Chicken and Broccoli with Rice. It’s made with everyday ingredients, so you might just have them on hand already. To bump up the flavor in this dish, I used extra-sharp cheddar cheese, and it’s delicious combined with the broccoli! If you are looking for more one-pot dinners, all my one-pot recipes can be found here. In this dish, I used the same technique for cooking the rice as my one-pan chicken burrito bowls. 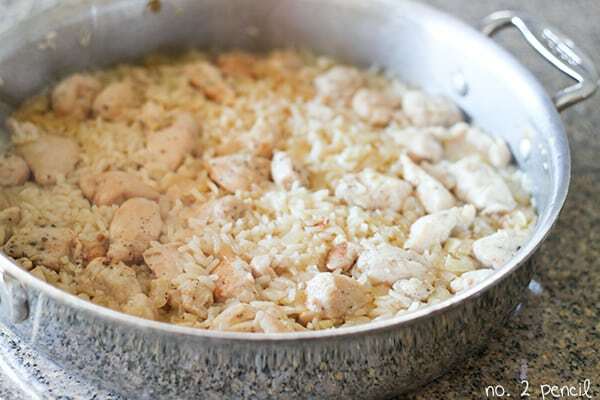 Once the chicken has browned, push it over to one side and sauté the rice in a little additional olive oil, all in the same pan. Sautéing the uncooked rice keeps the dish from being overly starchy, basically creating a rice pilaf. Once the rice starts to pick up a little color, add the chicken broth and cook the rice about half way. Next, stir in the broccoli florets and continue cooking. Adding the broccoli midway through cooking keeps it from getting overly soft. I like a bit of bite in my broccoli, and to see a pretty bright green color. Add more or less cheese to taste. In this recipe I used about 1 1/2 cups, stirring in 1/2 a cup directly into the rice once cooked, and sprinkling the top with the remaining cheese. Start by sautéing onions in two tablespoons of olive oil over medium heat. 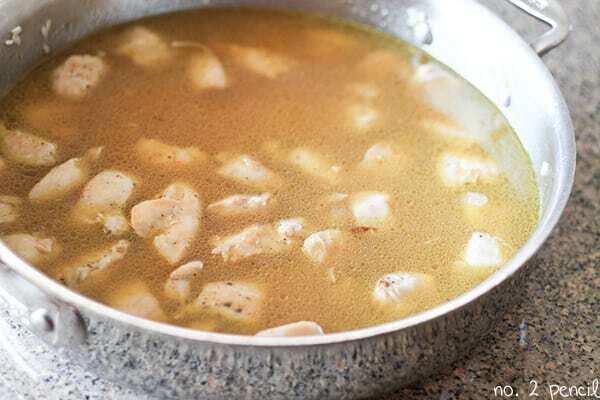 Once onions have started to soften, increase heat to medium high and add chicken breast to pan. Brown chicken breast pieces, then add minced garlic and cook for about 2 more minutes. Saute uncooked rice in olive oil until rice starts to take on a golden color, 2-3 minutes. Add chicken broth to pan, bring to a boil and stir to combine. 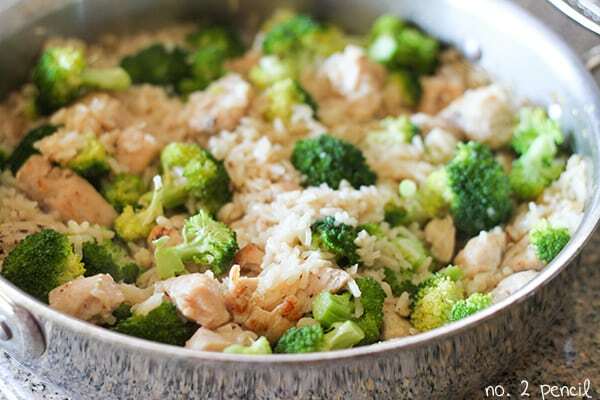 While chicken and rice is cooking, remove florets from broccoli, cutting into bite sized pieces. .
Stir in broccoli and continue cooking covered another 8 minutes on low, or until broccoli and rice are both tender. Sprinkle remaining cheese on top, place cover back on the pan and let cheese melt 2-3 minutes. Delicious! My daughter decided it was cheese-TASTIC! I only had frozen broccoli, but I threw it in while the chicken and rice cooked an it was great!!! Next time when usin frozen tho, I will reduce the broth by just a little. Thanks! I’m so glad! Thank you, Bridget! This was really good. I have three children and two under two and I am looking for simple, one pot recipes. This is so good! And easy too! For chicken: one package frozen & thawed tofu, cut into 1 inch chunks + 2 tbsp more oil, since tofu soaks it up. For cheese: You can use daiya, but I’m not a huge fan, so I mixed in about 1/4 cup vegan sour cream for added creaminess. All I have on hand is minute rice. Can I use that? If so, do I use the same amount of broth or less since it takes 5 minutes to cook to the rice according to the package? Are you using brown rice? If so, that would be the problem. White rice cooks in about 20 minutes while brown rice can take 45-60 minutes. I’m so glad! Thank you for the lovely comment! This was delicious. My very picky 2 1/2 year-old was shoveling it in! I’ll be making this again for sure. Thank you! My kids (4 and 2) and my hubby both loved this! It was very easy and very cheesy. 😉 My oldest son has asked for me to make it again. Thanks for sharing it!!! I have made this a couple times its delicious! The rice turned out a little crunchy the first time i made it too so i inceased the cooking time and that did the trick. Thanks for the recipe! I made this for supper tonight and it was very good! I love one pot meals so I have less to clean up. I made it just as the recipe says and it was great! I used frozen broccoli and it was good. I would cook the broccoli first a little bit as it was a little crunchy. Thanks for the recipe! I make this with riced cauliflower instead of broccoli so that my toddler can’t pick out the green stuff. It is a huge hit with kids and low carb which is great for my gestational diabetes!